How organized are you? As mentioned last week and when discussing this month’s theme in our #MemoryMakeover, we understand some of us are more organized than others. But even those of us who love organization sometimes get lazy in maintaining it. But there’s a way to change this. Organization is an action but most efficient as a habit. As a mom, I encourage my kids (& myself) to stay organized. It’s much easier to maintain a system than reorganize a mess. We all know this, yet for whatever reason: ease, laziness, or procrastination, we don’t do it. Then we’re tasked with having another big organization (or reorganization) project, which many of us dislike and don’t do either. This also applies to our memory. If we have organizational systems in place to help us, they’re ready at our fingertips or as a split-second thought. 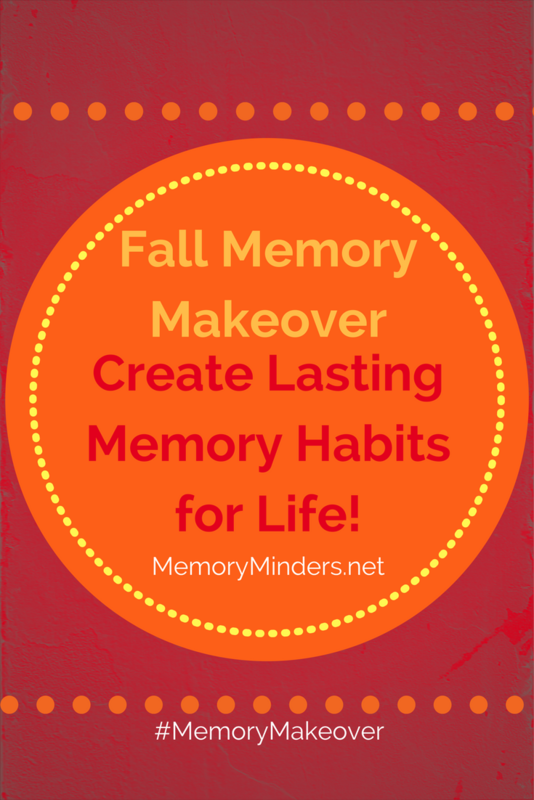 As we progress in our #MemoryMakeover series, I’ll share relevant and interesting research pertaining to our themes. This month it’s all about habits as we continue our series long habit formation and work specifically on organization. Creating habits involves time, effort and motivation. Habits must be action, not inaction. You cannot create a habit to stop doing something without replacing it with another thing. For example, we can’t make a habit to stop eating poorly, not exercising enough or not remembering names. Instead, we create habits to eat healthy foods, exercise daily or remember at least one person’s name. How this applies to our #MemoryMakeover is simple. Using your goals created in week one, stop a bad behavior by noting its cues/triggers and replacing the corresponding action with new, desired habits. Then keep going! If we’d like to remember names better, whenever we potentially meet someone new, let’s not zone or be distracted. We’ll note the trigger/cue (an event with new people) and then insert the new behavior instead of the unwanted. Let’s be prepared, pay attention and use a memory technique as our new behavior/habit action. Understanding memory types helps here too. We know there’s a split second to do something with this information (new name) as it moves from sensory to short and then to long term memory. If we’re prepared (and organized) with good attention skills, we can use a memory technique (repetition, association etc.) to do something with the info and be in a better position to remember it again. By being vigilant in noting cues to unwanted behaviors, we’ve now replaced our bad habit (not remembering names) with a new desired habit (being organized and using a memory technique) to remember names. We keep going and soon, we’re implementing the new habits when meeting someone or trying to remember a name. So this week’s homework is: diligently monitor for cues associated with bad memory habits (not remembering names) then replace them with new, desired habits (being organized, using a memory technique). When you notice the cue, do the new behavior instead! Creating and sustaining new habits like organization, using memory techniques and increasing attention skills will take effort and motivation. But by understanding and then utilizing habit formation fundamentals, we can indeed create a #MemoryMakeover with new memory habits! Gardner, Benjamin, Phillippa Lally, and Jane Wardle. “Making Health Habitual: The Psychology of ‘habit-Formation’ and General Practice.” The British Journal of General Practice 62.605 (2012): 664–666. Neal, David T., Wendy Wood, Jennifer S. Labrecque, and Phillippa Lally. “How do habits guide behavior? Perceived and actual triggers of habits in daily life.” Journal of Experimental Social Psychology 48 (2) (2012): 492-8. Lally, Phillippa & Benjamin Gardner. “Promoting habit formation.” Health Psychology Review, 7 (2011): S137-S158. Quinn, Jeffrey M., Anthony Pascoe, Wendy Wood, and David T. Neal. “Can’t control yourself? Monitor those bad habits.” Personality and Social Psychology Bulletin 36 (4) (2010): 499-511.